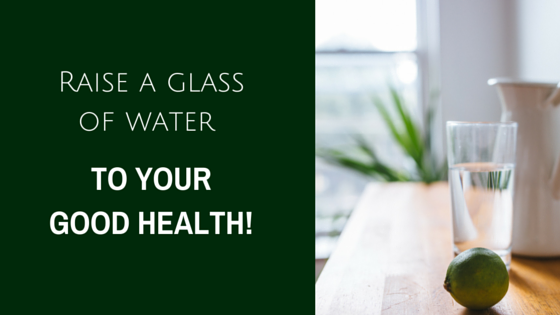 RAISE A GLASS OF WATER TO YOUR GOOD HEALTH! Water is one of the wonderful resources presented to you by Mother Nature. It is known as the elixir of life and you cannot live without it. It plays a vital role in sustaining your life. It does impact specific body operations and the maintenance of good health. Over 70% of your body consists of water. Apart from keeping your body hydrated, it helps you perform, feel and look better as well. Most of our organs need water to function. It keeps our tissues healthy, lubricates our joints, alleviates pain, and prevents muscle fatigue. It enhances your mental creativity and strengthens your immunity. Water also promotes heart health, prevents bladder problems, and improves digestive health. Water is vital to the functioning of your kidneys as they need water to flush out toxins. When you are well-hydrated, your body is able to remove waste and circulate blood & nutrients. Adequate hydration supports cellular health and biochemical processes as well. Drinking water at the right time has some amazing health benefits! Some exceptional things can happen in your body when you have water as your primary beverage. It helps you reduce the risk of a heart attack by preventing your blood from thickening, and by controlling your blood pressure. Ever wondered why people need to urinate so much during night? Here is the answer: Gravity holds water in the lower part of your body when you are upright (cause legs to swell). But when you lie down, the lower body (legs and etc) seeks level with the kidneys. This is when the kidneys remove the water since it is easier. Water can also come to your rescue during night when you get leg cramps. Your leg muscles are seeking hydration when they cramp and wake you up with Charlie Horse. There you go! Drinking water is important to your health for you to lose fat and keep your energy up. 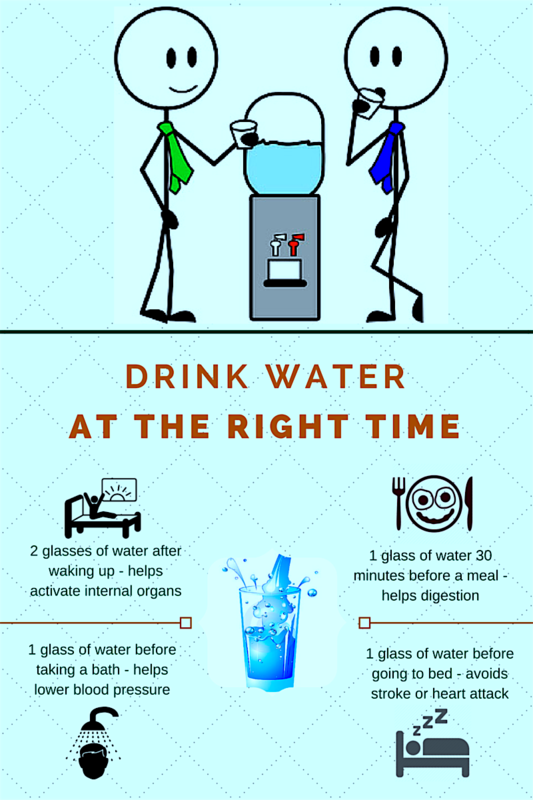 Keep yourself well-hydrated and at the right time! Remember, most people take water for granted. We waste water needlessly and don't realise that clean water is a very limited resource. More than 1 billion people around the world have no access to safe, clean drinking water. 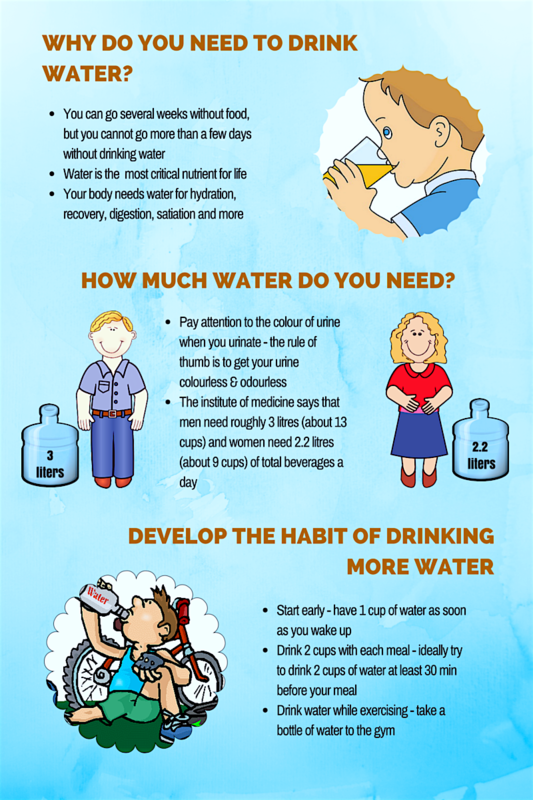 The effects of dehydration can be life threatening!